• Polish entry to be announced tomorrow at 18.30 in "Świat się kręci" on TVP1. Donatan & Cleo remain frontrunners for the job. • Title of Georgian entry is announced to be "Three Minutes To Earth"
• Russian broadcaster has quickly denied rumour spread by Love Radio, that Sergey Lazarev has been internally selected to represent Russia at Eurovision 2014. Entries are still being accepted by February 28. • 20:00 CET, Azerbaijan, "Böyük Səhnə". Avroviziya milli seçim turu, 3rd live show, iTV, online. Khana Hasanova, Dilyara Kazimova, Erkin Osmanli qualify to the final. Recording of the show can be seen here. • 20.15 CET, Lithuania: "Eurovizijos atranka", 11th show, Song selection, LRT1, online. Attention (Viktoras Vaupšas, Vilija Matačiūnaitė) becomes Lithuanian entry. All versions of "Attention": Vilija Matačiūnaitė (11), Vaidas Baumila (11), Mia (11), Monika Linkytė (10), Vaidas Baumila (9), Mia (8), Vilija Matačiūnaitė (6), Demo version. • 20.30 CET, Belgium: "Eurosong", 1st semifinal, Eén, online. Videos of performances can be seen here. • Teo presents Belarusian version of "Cheesecake" recorded with "Pavalyaki" ensemble. • Full results of Latvian Dziesma final revealed. Aarzemneiki clinched victory during last seconds of final recap. • Common Linnets (The Netherlands) have selected entry for Eurovision. No further details announced. • Tijana Dapčević (Macedonia) and Sergej Ćetković (Montenegro) record their Eurovision postcards, proceed to shootings of music videos. • 20.00 - 22.00 CET, Lithuania: "Eurovizijos atranka", 11th show, Song selection, LRT1, online. Due to the broadcast live from Euromaidan in Kyiv, preselection show has been moved to Sunday, at 20.00 CET. • 20.00 - 21.30 CET, Sweden: "Melodifestivalen", 4th semifinal, SVT1, SVT Europa, online. Finalists are: Anton Ewald and Alcazar, Second chance for Ellinore Holmer and Ammotrack. • 20.24 - 22.26 CET, Hungary: "A Dal", Final, M1, Duna World, online, Eurovision.tv. Kállay-Saunders András wins with Running. • 20.25 - 23.35 CET, Latvia: "Dziesma", Final, LTV1, online, Eurovision.tv. Aarzemnieki win with "Cake To Bake"
Watch the national final recorded here. • 21.30 - 22.35 CET, Macedonia: Song presentation, MRT1, online. Watch the song here: English version, Macedonian version. • 22.00 - 23.15 CET, Spain: "Mira quién va a Eurovisión", final, La1, online, Eurovision.tv. Ruth Lorenzo wins with Dancing in the Rain. With less than three months until showtime, the stage for the 2014 Eurovision Song Contest has begun to take shape in Copenhagen. At the moment, the stage’s rear wall is being moved from a workshop on Refshaleøen and into the B&W-Hallerne, where the three live shows will take place in May, reports DR.
explains Søren Andresen, who is DR’s technical project manager for the Eurovision Song Contest. "The next thing we are going to start on, is lighting and sound". Since August Søren Andresen has been very busy planning DR’s move to the historical industrical complex, where until 1996, Burmeister and Wain built their ships, and where the world’s biggest music competition will soon take place. "I am the first person to arrive at the venue, and the last one to leave", says Andresen, who with his assistant, will exchange his desk at DR’s headquarters for a mobile cabin on Refshaleøen at the beginning of March. "The biggest challenge is to get it all to come together, right up until the rehearsals start in the middle of April. We are going to work on a double shift basis in order to achieve it"
Andresen previously had technical responsibility for tv-shows like Dansk Melodi Grand Prix and the X-Factor finals. "But the Eurovision Song Contest is the biggest! Everything is doubled up! ", he says. "My work is first over on the 18th of May – one week after the Grand Final. By then we have to be out of the arena again". ESCKAZ continues series of Eurovision interviews speaking with enthusiastic representatives of Iceland - Pollapönk. Pollapönk inform us that they are very happy with the victory: "This is a dream come true for us. We are proud and we thank the Icelandic public to give us this opportunity". They have described their entry "Enga fordóma", which will be performed fully in English at Eurovision as "Colorful with a powerful message that the whole world needs to hear". "The song and the lyric was specially written for Eurovision. We wanted to try to make song that was not a typical Eurovision song (if you can say that there is something that you can call a typical Eurovision song) but with a catchy melody. We also wanted to try to write a lyric that had a message that would be a contribution to human rights campaign. I can assure everybody that our song and act is no joke. I hope our message will get through to the beautiful people of Europe. We will fight prejudice and discrimination with love." Defending choice of English, they said: "We want to try to get the message to as many people as possible. We had an idea to have the lyric in many languages but we found it to complicated". English lyrics are being written by famous American musiciant John Grant, who has recently moved to Iceland. First and foremost we've started cooperation with him because he writes brilliant lyrics and beautiful music. The fact that he lives here in Iceland and has been studying Icelandic made this an easy choice. And it dosen´t spoil things that we are all John Grant fans. 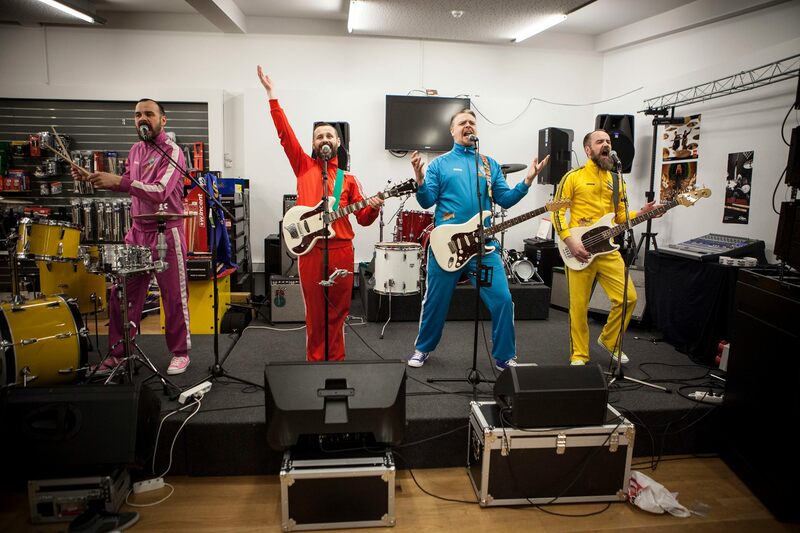 "The tracksuits are the bands outfits for all occasions and have been for many years. Extremely flexible and good gigsuits and for dancing as well, we are not caught in public without them as pollapönk. But for the finals here in Iceland we took it a step further and had high class "Tuxedo" suits tailor made for each of us in our colors Pink Blue Yellow and Red, and I do believe that gave us a bit extra for our performance in the finals. We are Blue, Pink, Red and Yellow and each member has his own link to the color like PinkPolli had a bit of prejudice toward the color because he had seen everywhere growing up that it was not a color that boys should wear only girls which is nonsense. But he has always liked the color so he looked inward and faced his prejudice regarding the color and wears it proud"
There are no big plans on the table on changes of the song itself, just minor adjustments are possible. Speaking about stage presentation, "There are meetings taking place every day on that matter. One thing's for sure! It we be amazing!. There are no plans yet for a promotional tours, "we do believe that pre contest is important, simply by meeting people with interest in the Eurovision song contest like us, hug them and spread the message of Pollapönk of no prejudice and love for all"
At the national final band was joined by two backing vocalists, and hopefully they will be able to travel to Copenhagen as well. "Bibbi – Snæbjörn Ragnarsson is the main songwriter and bassplayer of the band Skalmold. He also has one of the longest beard in the band. Óttarr Proppe is a legend. He is the singer in HAM, Dr. Spock, Rass and he is The Professor - a funk icon. He is also a Member of Parliament and Deputy Speaker".. It is not the first attempt of band members at Eurovision. "We all have participated in the pre-contest before, Heidar og Haraldur with Botnledja and Arnar and Gudni with Dr. Spock. Heiðar and Haraldur took part back in 2003. Botnleðja playes punk rock so this was kind of the first time a rock band took part in this contest. The memories are all good. We ended up in second place but the first place winner Birgitta won by a landslide. We don’t generally like the concept to compete in music but nevertheless this has been a great platform for us to help make the world a better place..
Our main aim at Eurovision will be having fun and making sure our message will cut through. No prejudice!" Asked about whether they've heard representatives of other countries band mentioned "I heard the Swiss entry a couple of days ago and the guy that sings that song is a excellent whistler". 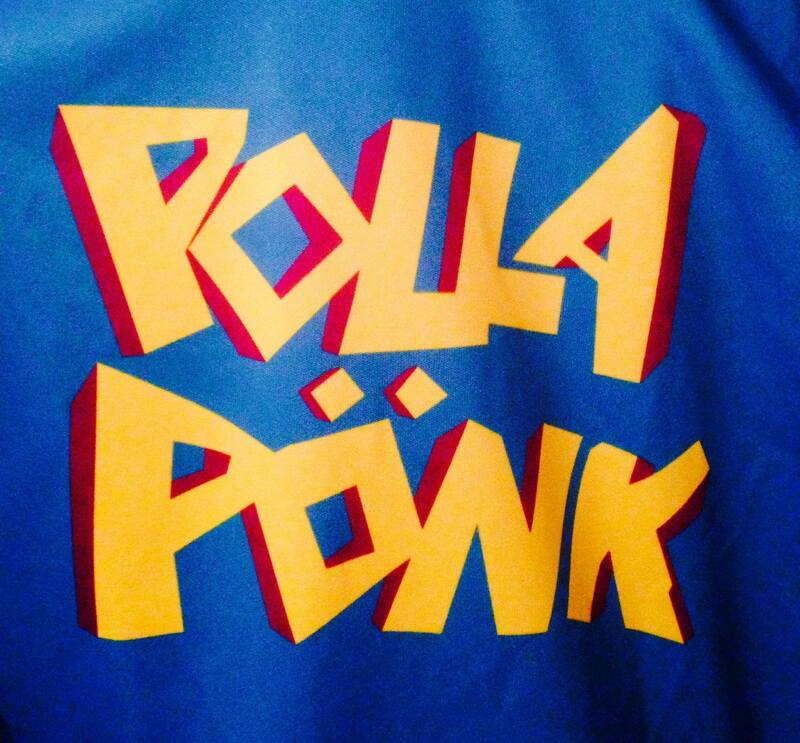 Besides Eurovision, band plans to release "Pollapunk - Best of" album in April with two new songs. "No Prejudice ! Spread the word"
You can read the full interview on our Facebook. Traffic, Maiken, Sandra Nurmsalu, Norman Salumäe, Brigita Murutar have qualified to the final. Jury had MiaMee in top 5 instead of Brigita. 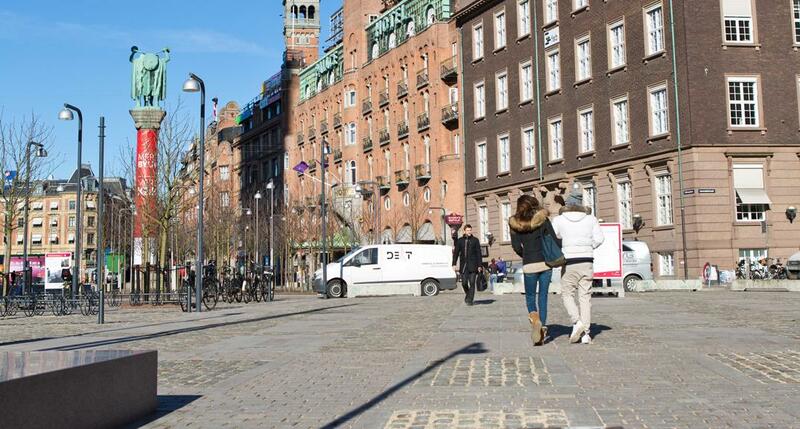 Eurovision Song Contest 2014 in Copenhagen will have a visible and clear LGBT profile and its very own Eurovision Pride Square in the heart of the city. At a meeting at Copenhagen City Hall 20 February 2014, it was decided to grant Copenhagen Pride with the necessary means to ensure that the Eurovision Song Contest will also reflect Copenhagen as a diverse and tolerant host city, where the LGBT community plays an important role. "Fortunately, the City of Copenhagen has agreed to Copenhagen Pride's vision about giving Eurovision Song Contest 2014 a clear and unambiguous LGBT character. [...] We are very pleased that the City of Copenhagen in this way accentuates Copenhagen Pride's leading role in securing and maintaining the profile that Copenhagen is a city for all citizens. We are the capital's largest festival, and the Pride embraces all Copenhageners. 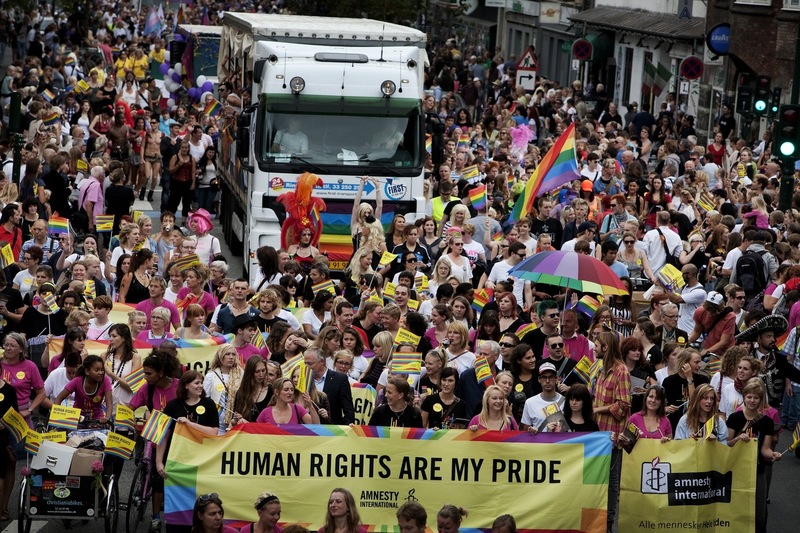 It is an important grant because it ensures that all visitors - LGBT and others - will experience Copenhagen's openness and tolerance,"
says Lars Henriksen, president of the Copenhagen Pride. Eurovision Song Contest is an event that holds a special place in the hearts of many LGBT people, and it is a crucial and unique opportunity to show the freedom, tolerance and diversity that characterises the Danish capital. One of Copenhagen Pride's initiatives is a special Eurovision Pride Square in central Copenhagen, where there will be entertainment, tents, and lots of rainbow atmosphere. Copenhagen Pride is also looking for ways to implement a Eurovision LGBT Street Party, and they will produce a printed magazine in English that will contain a full LGBT programme for the Eurovision event in Copenhagen. "Eurovision Song Contest 2014 is an all inclusive event taking place in a diverse and open city. We are thrilled that we as host city can offer our citizens and visitors their very own Eurovision Pride Square and LGBT programme thanks to the initiative and hard work by Copenhagen Pride," says Head of Events Ulrich Ammundsen from Host City Copenhagen. On February 6, Copenhagen City Council decided to name the square next to Copenhagen City Hall Rainbow Square in the name of the LGBT flag. The naming of the small but central square (located between Copenhagen City Hall, Lurblæserne and Vartov) has been up for discussion for a long time, and Copenhagen City Countil finally agreed on the name. 36 votes for, and only 9 against, so a large majority decided on the name Rainbow Square (Regnbuepladsen), inspired by the LGBT flag. • Armenian entry has been chosen from more than 75 submissions. To be presented along with music video by March 15. • Russian broadcaster has not yet taken a decision on the public preselection. Internal choice is possible. • Macedonian entry "Tamu kaj što pripaǵam" and it's English version "To The Sky" will be presented in "Hit of the Month" on MRT 1 tomorrow at 21.30 CET. • Montenegrin entry - a ballad, selfwritten by Sergej Ćetković, will be presented on March 9. • Titles of all entries of Belgian Eurosong are now known. • Entries, that have qualified to the final of Romanian preselection published. • Singers Donatan and Cleo invited by TVP to represent Poland at Eurovision. They have invited fans to help them make the decision on whether they should accept the proposal. • Pollapönk (Iceland) have confirmed to perform their entry fully in English at Eurovision. English lyrics are currently created by John Grant. B&W Halls will host Eurovision 2014, but their future after the contest is in doubt. State Administration is launching investigation, whether it may be anti-competetive to do renovation of the halls mostly on tax money, and then enter in competition with existing venues in Copenhagen for organization of major concerts and other events, writes Berlingske. says Peter Vesterdorf, specialist in State aid and senior adviser of law company Publicure. REDA has invested 5.2 million crowns in the project fund and they are not required to pay for any additional expenses that may appear along the way. In return, they have been also paid compensation for lost rent, since some of the halls activities and storage containers had to be moved away for Eurovision period. When the halls are finished, they will, according to Martin Bender, CEO of Host City Copenhagen, "stand out as a gem and a milestone in the Danish and Copenhagen cultural image". Christian Herskind, CEO of REDA, says that they indeed plan B&W Halls and the area at Refshaleøen to be used in the future as cultural and leisure place, bidding to host major events. "We hope that not only the Danes, but Europeans will increasingly use Refshaleøen when Eurovision is over. We already have large concerts there, we have a lot of activities and facilities, and their use will only be intensified", he says, adding, "Now, for example, put some nice coating around the place, and it is not getting picked up again when Eurovision is over". Christian Herskind emphasizes, however, that although REDA owns B&W Halls, they can't just go out immediately and bid for major events. There still are other obligations, for example Royal Theatre has numerous props in large containers in the halls and they would need to find another place for it. According to Peter Vesterdorf authorities are obliged to intervene in case of "unfair competition". If it will be confirmed that there indeed has been a breach of EU or Danish competition laws, REDA may be required to pay out for the additional value that the halls would gain through Eurovision. According to the head of department of supervision office in the state administration Hanne Villumsen, they will now examine whether there are grounds for a certain supervisory regarding municipal and regional grants for the redevelopment of the Halls. The results are expected within two weeks. Both the City of Copenhagen and the Capital Region say they are awaiting state administration research result, but they both believe that they have complied with all the rules. City of Copenhagen is expected to make a statement on 25 February. • Mei Finegold (Israel) finishes shooting of music videos to be premierred on February 27. Winning entry to be announced on March 5. • Songs of Norwegian MGP released on legal digital platforms. • Titles of entries of 1st semifinal of Belgian Eurosong announced. Songs available to preorder on iTunes. • Muzikfabrik win accoustic "A Dal", will be guests of Hungarian final. • Mariko Ebralidze (Georgia) has departed to Stuttgart to work on her contest entry together with band The Shin. Copenhagen will heavily rely on Malmö recepies to build successful Eurovision 2014. "It's silly to reinvent the wheel", says Ulrich Ammundsen from the project company ESC 2014, which will coordinate the large number of events that will shape Copenhagen in May. Therefore, the company has made use of the extensive preparatory work that Malmo did when the southern Swedish town last spring hosted Eurovision. On the Town Hall Square there is a huge clock that counts down to the opening ceremony of Eurovision Song Contest 2014. It is also borrowed from Malmo, where it stood at Stortorget last year in May. 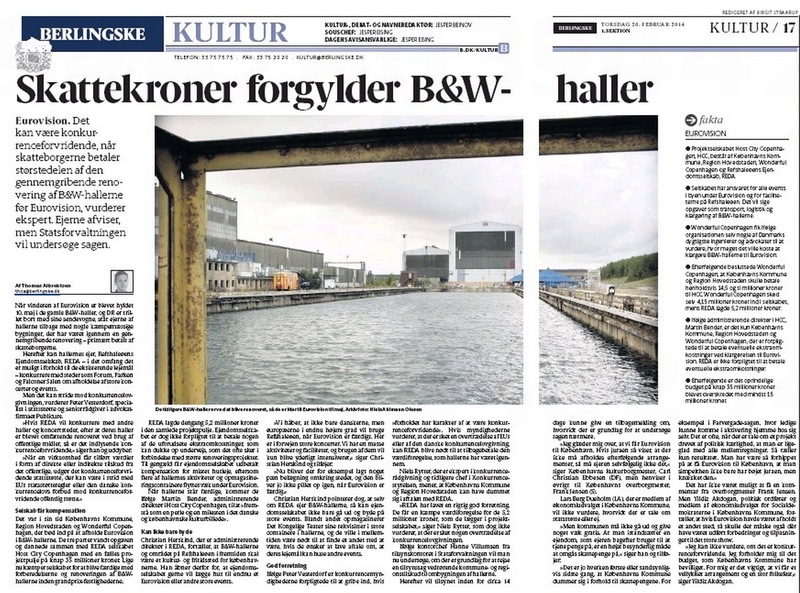 "It's a fun detail that shows how we can build on their success", says Ammundsen to the Politiken newspaper. 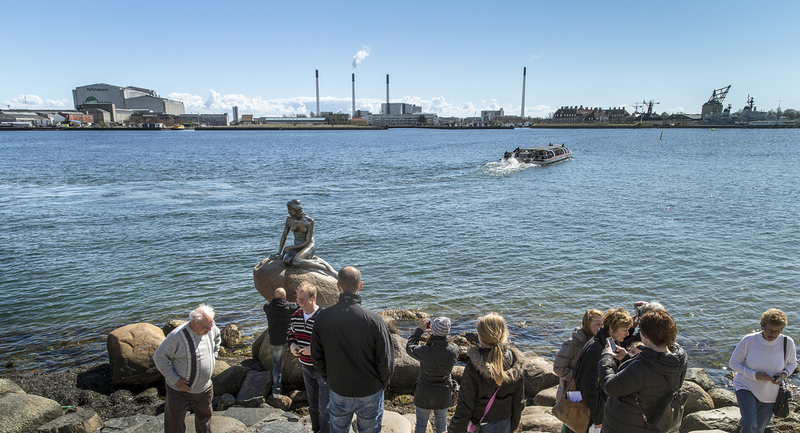 "When we began to bid on the project, our bid was inspired by Malmö's input. It gave us some good cards. It was also important throughout the bidding phase to draw strength from Malmo's experience. When we won, there was a new stage in the process where we've learnt about how they used volunteers, organized activities in urban spaces, arranged Euro Club for the accredited and so on", tells Ammundsen. 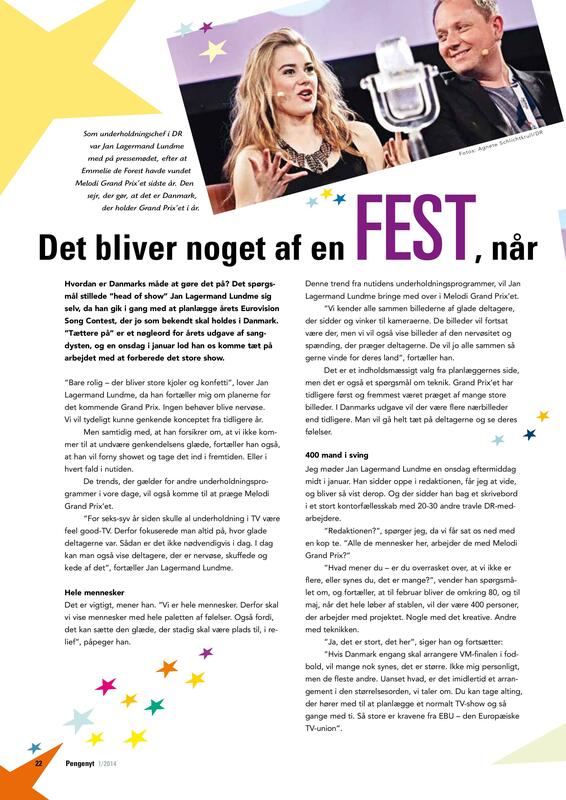 When Malmo last year was trying to find a form of hosting of the Eurovision 2013 it went to non-traditional approach trying to created a national festival and not increasing extravaganza. Instead of spending outrageous amounts of money to create prestige and glamor, they chose to go against EBU standard for a venue at least 10,000 square meters and use the Malmo Arena, which seats just 15,000 spectators. "It was SVT's thought about keeping it in a 'back to basics' style. It also fits the profile of Malmö with something genuine. It was important for us that Eurovision would not be just entertainment for the world, but also for our local communities", explains Mayor of Malmö, Katrin Stjernfeldt Jammeh. The project manager for Eurovision in Malmo, Karin Karlsson, says: "The starting point was that we should spend taxpayers' money wisely, so they also got the benefit of it. Therefore, we used the city's own institutions and produced our own celebrations. One of the ideas was to get artists to perform in the streets. It was not in the EBU plans, so we had to work hard to make that happen. On the whole, we have done a lot of work that Copenhagen can now copy", says Karin Karlsson. "I wish that it had been vise versa, Copenhagen had been hosting first, and we could have used their ideas", she jokes. "It has been a huge advantage for us that it is not Baku we would take over from. When I have a thought about for example Eurovision Village, the first thing I did was to ask how they did it in Malmö. It is very nice to have their experience in hand", says Ulrich Ammundsen. He is happy, since it probably had saved hundreds of thousands crowns, that would have been spent on hired consultants otherwise. While the project company ESC 2014 leans heavily on Malmo's experience, they will also go some new, untried routes, points Ammundsen. "We have made the dialogue with Malmo and looked at what we think works and what can fit into and then developed a number of new initiatives. It is a good mix of something that we know that works well and something new and untried before". Therefore people of Copenhagen probably will also experience Eurovision participants singing live in the city - just as they did in Malmö. But Malmö's open-air party on Gustav Adolfts Torg gets in Copenhagen versioned for 'The Fan Mile' - the distance from City Hall to Nyhavn. And as a special feature of Copenhagen Ulrich Ammundsen highlights choice of venue for the Eurovision: the old B & W Halls at Refshaleøen. "With the selection of B & W as a venue, we take it somewhere in a new direction with the whole story about a movement from industry to culture". "If something fails, remember that there is an arena only twenty minutes from here. We are the backup! ", jokes Mayor of Malmo, Katrin Stjernfeldt Jammeh. • Semifinal of Lithuanian preselection prerecorded today. Take A Look At Me Now topped Lithuanian jury vote with Attention coming 2nd. Some videos are available here. • 150 entries accepted in Romanian preselection. • Polish entry will be chosen internally after February 20. • Draw of running order and press-conference presentation of Spanish entries took place. • Entries of Norwegian MGP will be revealed tomorrow at 06.00 CET. Head of show Jan Lagermand Lundme says that they respect the concept of Eurovision from previous years. But at the same time DR aims to renew the show and take it into the future. All trends that apply to other entertainment events today, will also influence Eurovision. "Six or seven years ago all entertainment shows were feel-good TV. Therefore, the focus was always on how happy are the participants. This is not necessarily today. Today we can also show participants who are nervous, disappointed and sad", says Jan Lagermand Lundme. "We all are people, therefore, we will show people with the whole range of emotions. We all know the images of happy participants sitting and waving to the cameras. Such images will continue be there, but we will also show pictures of the nervousness and tension that characterizes the participants". It is a substantive choice by planners, but it is also a matter of technique. Danish Eurovision will bring more close-ups than ever, it will go very close to the participants to show their feelings. The stories will also be told by the 40-seconds long postcards between performances. "In fact, it is quite simply a matter of fill up the time while the gear from one country is removed and stage is made ready for the next country. But these 40-second spots has been used in a various ways before. In Azerbaijan, for example, as touristic advertisements of the hosting country. But we wanted something different. Instead, we will use them to provide a picture of the artists and their country. It is difficult at 40 seconds, but we will do so by taking participants through a process of attaching them to their countries, and through the way they handle this process, viewers will find out more about them", says Jan Lagermand Lundme. It is again a step in getting more emotions into the program. "The Swedes added last year humor to the show. It's a powerful feeling, and we will expand by adding more emotions", he says. "After Emmelie won in Malmo, the real trophy that DR got was an USB-stick, that contained the list of all tasks and preparations that must be in place for the next years show", he describes. "It's like the baton that we carry on. Or the Olympic torch". Lundme even admits that actual preparations have started even weeks before victory in Sweden. "Not because we knew we will win, but seeing that bookmakers have us as clear favourite, so we were expecting the victory. And then we made some first thoughts on how we can organize next year. It should not be any secret that we have worked very hard to win in recent years. We really focused on getting contest back, trying to get the best songwriters and the best performers on the stage". Lundme believes that the recent winning countries are united by the fact that they have really wanted to win. At this moment, there are about 80 people working in the team of organizers of the show. By May their number will reach about 400, some of them responsible for creative, some for technical parts. "It's an event on the same scale with World Cup finals. Or you can take everything of a regular TV entertainment show and then multiply it by ten times", says Lundme in an interview to Pengenyt magazine. All of it had to be done in close cooperation with the EBU, since Eurovision is their concept, and each year's show should reflect their values​. "We were from many sources warned that EBU can be rather difficult to deal with. But as they were able to see our progress, they are getting more and more relaxed. So we have hardly seen them saying 'no' to any of our proposals", says Lundme. He also sees a strength in the fact that Eurovision is a pan-European project. "There are big differences between countries in Europe, but song contest helps to bind us together", he says. And what applies to the whole of Europe , also applies to Denmark. "It shall be the celebration of the whole Denmark. All Danes had the part in Emmelies victory in the sense that they chose her as the representative of Denmark , and therefore all Danes also should feel that it is their party", emphasizes Lundme. What will happen on Sunday morning, when the show is over? "When I get my coffee and relax a bit, I'd probably like to think that it was a party across Europe that we could be proud of". But hard work doesn't stop him of dreaming to win Eurovision again. "We will do everything possible to repeat the victory, so we get a chance to make even better celebration next year. I can be making it here for the rest of my life", he says. 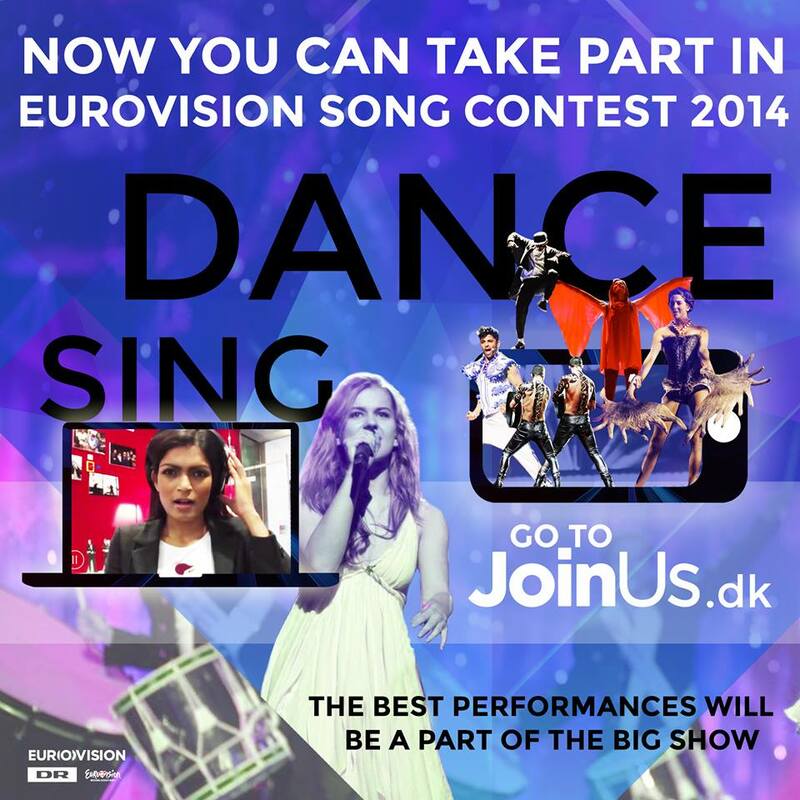 DR and Eurovision.tv have launched two campaigns for fans to get involved in the Eurovision show. They will be running from February 17 2014 to April 14 2014. Sing to join Emmelie De Forest in the Eurovision choir! Sing along and get the chance to appear on the big screen. With millions across Europe watching you can join last year's winner performing 'Only Teardrops' at the 2014 Eurovision Song Contest. (Professional singers are not allowed). The producers of show will use fans' voices to create a gigantic virtual choir, and the choir will be shown as part of the first Semi-Final of the Eurovision Song Contest on the 6th of May. Or dance and record using your phone to get invited to the final. Visit JoinUs.dk on your Smartphone. Show off 15 seconds of your coolest dance move - record it with your phone in Landscape mode for best results. Dance to your own music or visit joinus.dk/track on a second phone or your computer and play the Eurovision Beat whilst you're dancing. The wildest and best dance-moves will be selected, and dancers will be offered a plane ticket and stay to Copenhagen – and be invited to dance live on stage as part of the second Semi-Final on the 8th of May. All contributions will be published on JoinUs.dk. Head of Show for the 2014 Eurovision Song Contest, Jan Lagermand Lundme, comments: "One of our main ambitions – and the central theme of the 2014 Eurovision Song Contest – is to bring people closer together. To realise this, we are reaching out to everyone across the world and inviting them to sing or dance in the show. We are saying: come and join us! It’s fantastic that we can join together to help create the Eurovision Song Contest this year." Almost 237 million DKK - that's the price Copenhagen has to pay for Eurovision Song Contest on Refshaleøen. The millions however were allocated not only for the festive television entertainment - but also as investment that can bring money to Denmark, Copenhagen and the Capital Region in the future. says the regional president in the capital, Sophie Hæstorp Andersen (S), who together with the Capital Region has issued 10 million for Eurovision and just paid an additional 4.3 million to cover a cost overrun. "Eurovision means that Copenhagen in the long run will be branded positively, and thus it will help the tourists spot Copenhagen and return here", says Copenhagen's cultural and leisure Mayor Carl Christian Ebbesen (DF). Copenhagen has provided 14.5 million kroner for the event. 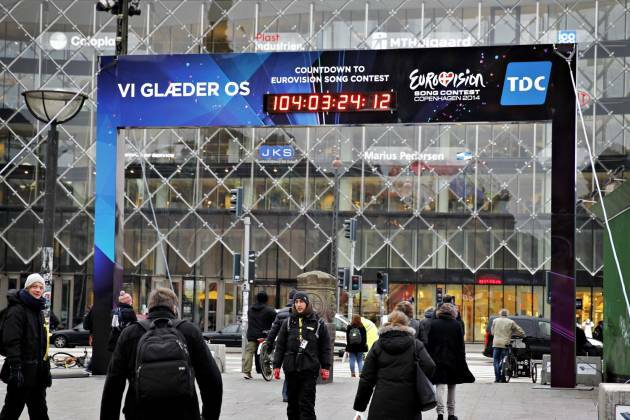 "It is an investment in the future", said Yildiz Akdogan (S), member of the municipal Culture and Economic Committee which is expected to provide an additional allocation of 4.3 million DKK for the Eurovision at the end of the month. But, according to Politiken newspaper, politicians paint too positive picture of the long-term economic benefits of the upcoming Eurovision. Newspaper has consulted several Nordic experts on this subject. Among them is professor Tommy Andersson from Business School at the University of Gothenburg, who researches tourism and events. He points out that of course Copenhagen will get an immediate financial gain from tourism, for example in the form of increased hotel nights during the Grand Prix. But in the long run it is a myth to believe that the Eurovision will have a monetary value for Copenhagen and Denmark, he said. "Politicians and tourism organizations are talking often of such an effect, but there is no scientific evidence that it leads to increased tourism and jobs," he said. "Research shows that not even the Olympics deliver positive effects in the long term, so it is unlikely to expect any effect of a Grand Prix finals"
What one can say with certainty, according to Swedish Professor Tommy Andersson, it is the positive effect the Grand Prix has on the people who live where it is held. He compares Eurovision to a big party at home. It costs money, but when you stand and have to clean up the next day, it was worth it, because you yourself and the guests had a good experience. "The greatest effect is for locals who see it as a celebration of the city, benefit a lot from it and feel a sense of pride," he said. Newspaper mentions that tourist organization Wonderful Copenhagen has not examined any long-term effects of organization of Eurovision and has not studied the impact of the Eurovision in Parken in 2001, in the long run in terms of tourism and job creation. Instead Wonderful Copenhagen refers only to the immediate effects by up to "80,000 nights, a tourism-based revenues of up to 125 million DKK and a valuable global media coverage and visibility, among other 170 million television viewers." But 'global visibility' does not necessarily provide long-term economic effects, says Professor Tommy Andersson. "It is certainly true that one gets a global attention, but I do not think it will make any measurable effects on tourism or economy. There is certainly no scientific studies showing it. Therefore, I am skeptical about it". • Non-qualified entries from Belgian Eurosong: Jessy - "Beautiful"; Mr. Jones - "Still Believe"; Joyce - "I think I"; Whitebird - "Fire & Ice" are available on iTunes. Line up of the semifinals revealed. • Final versions of the songs taking part in Spanish preselection released. • 30-second extracts of songs taking part in Danish Melodi Grand Prix presented. • 3 songs that will be performed in Lithuanian semifinal this week have been determined. 6 of 9 possible combinations have already been performed and can be seen here. • Dutch entry of The Common Linnets will be chosen by the duet internally by the end of the week. • 20:00 CET, Azerbaijan, "Böyük Səhnə". Avroviziya milli seçim turu, 2nd live show, iTV, online. Erkin Osmanli, Dilyara Kazimova, Samira Efendiyeva, Azad Shabanov, Khana Hasanova, Elton Ibrahimov qualify to the next stage. • 20.24 CET, Hungary: "A Dal", 2nd semifinal, M1, Duna World, online. Kállay-Saunders and Fool Moon are jury choices, while Dénes Pál and Honey Beast qualify through televoting. Separate performances videos are available here. • 20.30 CET, Belgium: "Eurosong", Call Back round, Eén, online. Bandits, Sil, Day One, 2Fabiola ft Loredana qualify to the semifinals. Cult Danish Eurovision musical - "Vi maler byen rød: The Musical" will make it's return in Copenhagen for a week prior to the Eurovision Song Contest in Denmark. The show (written by Rasmus Mansachs) was originally played in Copenhagen, Denmark in April 2010 and was based on and filled with 24 of the biggest Danish Eurovision Song from the 1950s up to the present. Birthe Kjær, original performer of Eurovision 1989 entry Vi maler byen rød (We're painting the town red), that gave it's title to the musical, herself was in the audience in the premiere weekend. The show gained cult status long before its premiere, becoming the most "liked" Danish play on Facebook ever. Since then, the show has been staged several times around Denmark by different theatre groups and has become one of the most performed musicals of the decade in Denmark, having played all across the country numerous times each year since it first opened. Musical is filled with Dansk Melodi Grand Prix hits: "Dansevise", "Hallo hallo", "Sku' du spørg' fra no'en", "Under stjernerne på himlen", "Krøller eller ej", "Disco tango", "Alt det som ingen ser", "Ka' du se hva' jeg sa'", "Kloden drejer", "Skibet skal sejle i nat", "Tænder på dig", "Danse i måneskin", "Video video", "Boom boom", "Vi danser rock og rul", "Denne gang", "Fra Mols til Skagen", "Hip hurra det' min fødselsdag", "Lige der hvor hjertet slår" etc. 36 actors, singers and dancers on stage are involved in production. The show is directed by Marie Louise Cornelius. It is a humorous, festive and dramatic show about the wild youth of the 1980s when we follow a high school class that gets hit by a scandal just prior to students' matriculation. Love, family, friendships, relationships, secrets, lies and revelations come to light in which young people and their parents' hopes and dreams for the future are put to the test and evolve in directions that the characters do not even fully anticipated. Along the way there are both mysteries and surprises up in its sleeve, not to mention the laughter, tears and colors in abundance within the touching finale. On 24 April 2014, Vi maler byen rød: The Musical will be revived in Copenhagen, both to celebrate the 25 years anniversary of the title track, as well as to warm up for the Eurovision finals in Copenhagen. 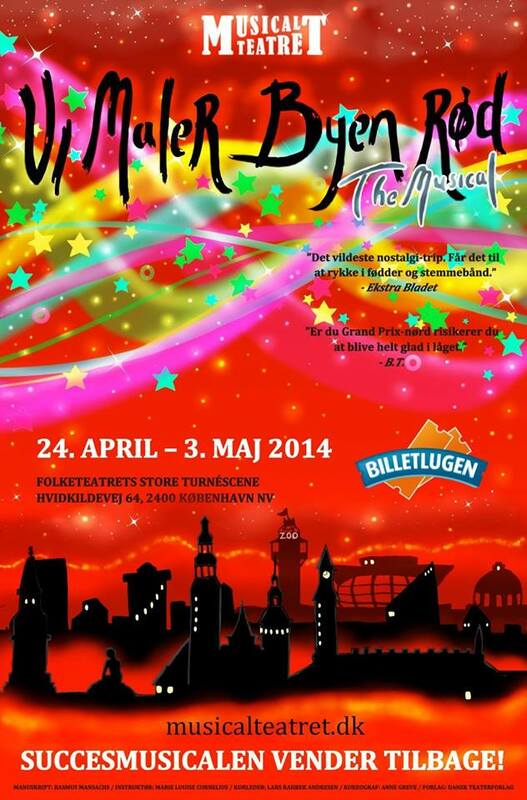 Show will be staged by Musicalteatret on Folketeatrets Store Turnéscene every day from April 24 to May 3. Tickets can be purchased on Billetlugen.dk for 120-220 DKK. • 20.00 CET, Lithuania: "Eurovizijos atranka", 10th show, LRT1, online. Mia, Vaidas Baumila, Vilija Matačiūnaitė - finalists of Lithuanian preselection. Watch the show in LRT Archive here. • 20.00 CET, Sweden: "Melodifestivalen", 3rd semifinal, SVT1, SVT Europa, online. Oscar Zia and Ace Wilder are direct finalists, Outtrigger and State of Drama will take part in Second Chance round. Watch the show on demand on SVT Play. • 20.24 CET, Hungary: "A Dal", 1st semifinal, M1, Duna World, online. Király Viktor and Bogi - choice of jury. New Level Empire and Depresszió - choice of televoters. Watch the full show again here or separate performances here. • 20.45 CET, Iceland: "Söngvakeppnin", Final, RÚV, online, Eurovision.tv. Pollapönk will represent Iceland at Eurovision 2014 with Enga fordóma. • Представитель Польши будет объявлен завтра в 21.30 Москвы в программе Świat się kręci на телеканале TVP1. Donatan & Cleo остаются фаворитами. • Объявлен заголовок грузинской песни - "Three Minutes To Earth"
• Телеканал Россия, после запроса ESCKAZ, категорически опроверг информацию Love Radio о том, что Сергей Лазарев был выбран внутренним отбором представителем России на Евровидении 2014. Представители телеканала подчеркнули, что до 28го февраля продолжается прием заявок от заинтересованных исполнителей. • 23:00 Москвы, Азербайджан, "Böyük Səhnə". Avroviziya milli seçim turu, 3е шоу, iTV, онлайн. Хана Гасанова, Диляра Кязимова, Эркин Османли вышли в финал. • 23.15 Москвы, Литва: "Eurovizijos atranka", 11я программа, Выбор песни, LRT1, онлайн. Attention (Viktoras Vaupšas, Vilija Matačiūnaitė) становится литовской песней. Все версии "Attention": Vilija Matačiūnaitė (11), Vaidas Baumila (11), Mia (11), Monika Linkytė (10), Vaidas Baumila (9), Mia (8), Vilija Matačiūnaitė (6), Demo version. • 23.30 Москвы, Бельгия: "Eurosong", 1й полуфинал, Eén, онлайн. • Тео представляет белорусскоязычную версию "Cheesecake" записанную с ансамблем "Павалякi". • Объявлены полные результаты латвийского отбора Dziesma. Aarzemneiki добились победы на последних секундах рекапа. • Common Linnets (Нидерланды) определились со своей песней для Евровидения. Другие детали о ней пока держутся в секрете. • Tijana Dapčević (Македония) и Sergej Ćetković (Черногория) записали открытки для Евровидения и приступили к съемкам своих видеоклипов. • 23.00 - 01.00 Москвы, Литва: "Eurovizijos atranka", 11я программа, Выбор песни, LRT1, онлайн. Из-за показа прямого эфира с Евромайдана в Киеве, показ отборочного шоу перенесен на воскресенье, 23.00 Москвы. • 23.00 - 00.30 Москвы, Швеция: "Melodifestivalen", 4й полуфинал, SVT1, SVT Europa, онлайн. В финал выходят: Anton Ewald и Alcazar, второй шанс для Ellinore Holmer и Ammotrack. • 23.24 - 01.26 Москвы, Венгрия: "A Dal", Финал, M1, Duna World, онлайн, Eurovision.tv. Kállay-Saunders András побеждает с Running. • 23.25 - 02.35 Москвы, Латвия: "Dziesma", Final, LTV1, онлайн, Eurovision.tv. Aarzemnieki одерживают победу с "Cake To Bake"
Запись национального отбора вы можете увидеть здесь. • 00.30 - 01.35 Москвы, Македония: Презентация песни, MRT1, онлайн. Смотрите песню здесь: английская версия, македонская версия. • 01.00 - 02.15 Москвы, Испания: "Mira quién va a Eurovisión", Финал, La1, онлайн, Eurovision.tv. Ruth Lorenzo побеждает с Dancing in the Rain. Уже менее трех месяцев остается до финала Евровидения 2014, и, наконец, в Копенгагене приступили к возведению сцены конкурса. В настоящее время задник сцены перевозят из мастерской на Рефсхалеюне внутрь B&W-Hallerne, где в мае состоятся три шоу Евровидения. объясняет Сёрен Андерсен, технический менеджер проекта Евровидения от DR. "После этого мы начнем работу над звуком и освещением". С августа, Сёрен Андерсен был занят планированием переезда DR в исторический индустриальный комплекс, в котором до 1996 года компания Burmeister and Wain строила свои корабли, и где в скором будущем пройдет самое крупное музыкальное состязание Европы. "Я первым приезжаю в зал, и последним уезжаю", говорит Андерсен, который вместе со своим помошником в начале марта окончательно променяет свой кабинет в штаб-квартире DR на передвижную кабинку на Рефсхалеюне. "Самым сложным является все завершить до начала репетиций в середине апреля. Нам придется работать в две смены, чтобы успеть добиться этого"
Андерсен ранее работал на датском национальном отборе Dansk Melodi Grand Prix и финалах шоу X-Factor. "Но Евровидение несомненно самый крупный проект! На нем все удваивается! ", говорит он. "Моя работа будет завершена 18го мая - через неделю после финала. К тому времени мы снова покинем арену". ESCKAZ продолжает серию интервью с участниками Евровидения беседой с представителями Исландии - группой Pollapönk. Pollapönk сообщили нам, что очень рады своей победе: "Для нас сбылась мечта. Мы очень горды, и благодарим исланских зрителей за то, что они дали нам такую возможность". Группа описала свою песню "Enga fordóma", которая будет на конкурсе исполняться полностью на английском языке как "Красочную с мощным месседжем, который должен услышать весь мир". "Песня и ее текст были написаны специально для Евровидения. Мы хотели попытататься сделать не типичную песню Евровидения (если можно сказать, что существуют песни, типичные для Евровидения) но с запоминающейся мелодией. Мы также хотели написать текст, у которого был бы сильный месседж, который бы относился к кампании по защите прав человека. Я могу заверить всех, что наша песня и номер - это не шутка. Я надеюсь, что нас месседж будет понят прекрасными жителями Европы. Мы боремся с предрассудками и дискриминацией с помощью любви." Объясняя выбор английского языка, участники группы говорят: "Мы хотим донести наш месседж до наибольшего возможного количества людей. Сначала у нас была идея написать текст сразу на многих языках, но мы решили, что это будет слишком сложно". Английский текст песни пишет известный американский музыкант Джон Грант, который недавно перебрался в Исландию. Прежде всего, мы начали сотрудничество с ним, потому что он пишет прекрасные тексты и прекрасную музыку. И то, что он живет в Исландии и учил исландский язык, сделало наш выбор легким. Ну, и конечно, в добавок ко всему, мы большие поклонники Джона. .
"Спортивные костюмы - это одежда группы на все случаи, мы выступаем в них уже многие годы. Чрезвычайно гибкие, они отлично подходят для выступлений, для танцев, да и без них люди не всегда узнают нас как pollapönk. Но для финалов в Исландии, мы зашли немного дальше, и для нас были вручную сшиты высококлассные костюмы "Tuxedo" в наших традиционных цветах - розовомм, голубом, желтом и красном, и я думаю, что они нам помогли добиться результата в финале. Да, у каждого из нас свой цвет и свое имя, например PinkPolli, розовый, у него было небольшое предубеждение к своему цвету, потому что он видел в детстве, что этот цвет не носят мальчики, а только девочки - но ведь это чушь. Но ему всегда нравился сам цвет, потому он поборол себя и свои предрассудки по отношению к этому цвету, и носит его с гордостью"
Больших планов по изменению самой песни у группы нет, возможны только небольшие доработки. На вопрос о сценическом выступлении, группа ответила: "Сейчас мы как раз проводим совещания по этому вопросу. Точно одно! Оно будет потрясающим!. Пока у группы нет планов на промо-туры, но "мы верим, что предконкурсный промоушен очень важен, просто встречаться с людьми, интересующимися конкурсом Евровидение, обнимать их и распространять месседж Pollapönk - об отказе от предрассудков и всеобщей любви"
На национальном отборе с группой выступили два бэк-вокалиста, и вероятно они присоединятся к ним и в Копенгагене. "Bibbi – Snæbjörn Ragnarsson - главный автор и басист группы Skalmold. Еще у него самая длинная борода в группе. Óttarr Proppe - настояшая легенда. Он - солист групп HAM, Dr. Spock, Rass, его прозвище - The Professor - он икона для всех любителей фанка. Сейчас он также является депутатом парламента и вице-спикером в нем"..
Это не первая попытка участников группы попасть на Евровидение. "В общем, мы все участвовали в отборах на Евровидение раньше - Heidar и Haraldur с Botnledja и Arnar и Gudni с Dr. Spock. Heiðar и Haraldur принимали участие в отборе 2003 года. Botnleðja играет панк-рок, и это было практически первым случаем участия рок-группы в исландском отборе на конкурс. У нас очень хорошие воспоминания об этом. Мы заняли второе место, но победила с большим отрывом Биргитта. Вообще мы не очень любим концепцию соревнования в музыке, но тем не менее, это отличная площадка для нас, помочь сделать мир немного лучше..
Наша главная цель на Евровидении - получить удовольствие, и позаботиться о том, чтобы наш месседж был понят публикой. Нет предрассудкам!" На вопрос, слышали ли они песни, которые представят на Евровидении другие страны - участники группы заметили: "Я слышал песню Швейцарии пару дней назад, и парень, которую поет ее - отлично умеет свистеть". Помимо Евровидения, группа планирует выпустить в апреле сборник лучших песен "Pollapunk - Best of" с двумя новыми песнями. "Нет предрассудкам! Распространяйте этот посыл!" C полным текстом интервью (на английском) вы можете ознакомиться в нашей странице в Facebook. Traffic, Maiken, Sandra Nurmsalu, Norman Salumäe, Brigita Murutar вышли в финал отбора. В пятерке жюри вместо Бригиты были MiaMee. Евровидение 2014 в Копенгагене будет иметь видимую и четкую ЛГБТ специализацию и свою площадь Eurovision Pride Square в центре города. На совещании в мэрии Копенгагена 20 февраля 2014, было принято решение о предоставлении организации ЛГБТ движения Copenhagen Pride всех необходимых средств для обеспечения того, чтобы Евровидение продемонстрировало Копенгаген как разнообразный и толерантный город, где ЛГБТ-сообщество играет важную роль. говорит Ларс Хенриксен, президент организации Copenhagen Pride, проводящей ежегодные гей-парады в датской столице. Евровидение - это событие, которое занимает особое место в сердцах многих членов ЛГБТ сообщества, и оно дает одну из важнейших и уникальных возможностей показать свободу, терпимость и разнообразие, которое характеризует датскую столицу. Одной из инициатив Copenhagen Pride стало создание площади Eurovision Pride Square в центре Копенгагена, где будеут расположены развлекательные точки, палатки и множество радужной атмосферы. Copenhagen Pride также ищет возможность проведения уличной ЛГБТ вечеринки Евровидения, и также будет выпускать специальный журнал на английском языке, который будет содержать в себе полную ЛГБТ программу событий в Копенгагене во время Евровидения. "Евровидение 2014 - это всеобъемлющее мероприятие, проходящее в разнообразном и открытом городе. Мы рады тому, что как принимающая сторона, сможем предложить нашим гражданам и гостям свою собственную Eurovision Pride Square и ЛГБТ программу благодаря инициативе и проведенной работе Copenhagen Pride", говорит руководитель проектов мероприятий Ульрик Аммундсен, представитель Host City Copenhagen. 6го февраля, городской совет Копенгагена решил переименовать площадь, прилегающую к городской ратуше в Rainbow Square (Радужную площадь) в честь цветов ЛГБТ флага. Наименование маленькой, но центрально расположенной площади, обсуждалось уже долгое время, и городской совет наконец смог о нем договориться. С 36 голосами за и 9 против, большинство приняло имя Regnbuepladsen, Радужной площади, вдохновленное ЛГБТ фланом. • Песня Армении была выбрана из более че 75 заявок. Она будет представлена с видеоклипом до 15го марта. • Российский вещатель еще не принял решения о проведении открытого отбора. Возможно, песня для конкурса будет выбрана внутренним решением. • Македонская песня "Tamu kaj što pripaǵam" и ее английская версия "To The Sky" будут представлены в программе "Хит месяца" завтра на телеканале MRT в 00.30 Москвы. • Стали известны названия всех песен бельгийского Eurosong. • Опубликованы песни, принимающие участие в финале румынского отбора. • Исполнители Донатан и Клео приглашены телеканалом TVP представить Польшу на Евровидении. Они пригласили своих поклонников помочь им решить, согласиться ли на это приглашение. • Pollapönk (Исландия) подтведили, что будут исполнять свою песню на Евровидении полностью на английском языке. В настоящее время английский текст песни пишет Джон Грант. В B&W Halls пройдет Евровидение 2014, но их будущее после конкурса остается туманным. Государственная администрация начинает расследование, является ли реновация залов за деньги налогоплательщиков признаком недобросовестной конкуренции, ведь после этого залы смогут конкурировать с другими крупнейшими площадками Копенгагена по организации крупных концертов и других мероприятий, пишет газета Berlingske. говорит Петер Вестердорф, известный специалист по вопросам государственной помощи, старший советник правовой конторы Publicure. REDA инвестировала 5.2 миллионов крон в фонд проекта, и не должна будет тратиться на дополнительные расходы, которые могут возникнуть на пути его реализации. В ответ, она также получила компенсацию за утраченную арендную плату, ведь некоторым из арендаторов залов, проводящих в них различные мероприятия или хранящие контейнеры, придется покинуть их на период Евровидения. Когда реновация залов будет завершена, они, по словам руководителя Host City Copenhagen Мартина Бендера, "станут жемчужиной и вехой в культурном имидже Дании и Копенгагена". Кристиан Херскинд, руководитель REDA, говорит, что действительно планирует использовать B&W Halls и другую территорию Рефсхалеюна для организации мероприятий культуры и отдыха, и подавать заявки на проведение крупнейших событий. "Мы надеемся, что не только датчане, но и европейцы станут все больше использовать Рефсхалеюн по окончанию Евровидения. Мы уже проводили здесь крупнейшие концерты, у нас здесь есть большое количество видов деятельности, и использование этих площадок будет только увеличиваться", говорит он, добавляя, "Например, сейчас мы делаем очень хорошее покрытие территории, и, конечно же, мы не станем удалять его после Евровидения". Херскинд, однако, подчеркивает, что хотя REDA является владельцем B&W Halls, они не могут немедленно начать подавать заявки на проведение в них крупных мероприятий. Есть еще и другие обязательства, например, Королевский театр хранит большое количество декораций в больших контейнерах в залах, и им придется найти другое место для этого. По словам Петера Вестердорфа, власти обязаны вмешаться в случаях несправедливой конкуренции. Если действительно будет подтверждено, что произошло нарушение законодательства ЕС и Дании, REDA придется выплатить обратно всю добавочную стоимость, которые ее залы заработают во время проведения Евровидения. По словам главы депортамента отдела контроля в государственной администрации Ханне Виллумсен, они в настоящее время начали исследование, есть ли повод для проведения надзора за выделением муниципальных и региональных грантов на развитие залов. Его результаты ожидаются в течении 2х недель. Муниципалитет Копенгагена и Столичный регион ждут ответа от государственной администрации, но полагают, что их проект соответствует всем правилам. Заявление от муниципалитета Копенгагена по этому вопросу ожидается 25го февраля. • Мэй Файнгольд (Израиль) завершает съемки видеоклипов, премьера которых пройдет 27го февраля. Песня-победитель будет объявлена 5го марта. • Песни норвежского MGP были выпущены на легальных цифровых платформах. • Стали известны названия песен 1го полуфинала бельгийского Eurosong, предзаказ песен возможен на iTunes. • Muzikfabrik побеждают в акустической версии "A Dal", станут гостями венгерского национального финал\а. • Марико Эбралидзе (Грузия) отправилась в Штуттгарт для записи своей конкурсной песни вместе с группой The Shin. Копенгаген во многом будет полагаться на опыт Мальме для организации успешного Евровидения 2014. "Было бы глупо снова изобретать колесо", говорит Ульрик Аммундсен из проектной компании ESC 2014, которая будет координировать большое количество мероприятий, которые охватят Копенгаген в мае. Для достижения успеха, компания широко использует опыт своих шведских соседей, проводивших Евровидение прошлой весной. На Ратушной площади расположены огромные часы, которые показывают отсчет времени, оставшегося до церемонии открытия конкурса Евровидение 2014. Их также взяли взаймы у Мальме, где они стояли на площади Stortorget в мае прошлого года. "Это забавная деталь, которая показывает, как мы можем строить свой успех на их опыте", говорит Аммундсен в интервью газете Politiken. "Когда мы подавали заявку на проведение конкурса, она была основана на идеях Мальме. Это уже дало нам карты в руки. Было важным на фазе заявки использовать все сильные места опыта наших соседей. Когда мы одержали победу, то приступили к новой стадии процесса, стали более подробно узнавать, как они использовали волонтеров, организовывали различные мероприятия на городских площадках, работу Евроклуба для аккредитованных представителей прессы и т.д. ", говорит Аммундсен. Когда Мальме пыталось выбрать форму проведения Евровидения 2013 в прошлом году, оно решили пойти по нетрадиционной дорожке, и нацелиться на создание прежде всего национального фестиваля, а не все увеличивающего экстравагантного события. Вместо растрат невероятных сумм на создание престижа и гламура, они пошли против стандартов ЕВС, предписывающих проводить конкурс в аренах не менее 10.000 кв.м. масштабом, и использовать вместо этого маленькую Malmo Arena, вмещающую всего 15.000 зрителей. "Это было идеей SVT, вернуть конкурс к его основам. Это также лучше всего подходило к стилю города Мальме, как нечто настоящее, а не искусственное. Для нас было важным сделать Евровидение не только развлечением для всего мира, но и для наших местных жителей", говорит мэр Мальме Катрин Стьернфельдт Яммех. Менеджер проекта в городе Мальме, Карин Карлссон говорит: "Нашей точкой отсчета было то, что мы должны тратить деньги наших налогоплательщиков с умом, чтобы они также получали пользу от проведения конкурса в их городе. Потому, мы использовали институты нашего города и провели ряд собственных мероприятий в нем. Одной из наших идей было - вывезти конкурсантов для выступлений на городские улицы. Это не было в первоначальных планах ЕВС, поэтому нам пришлось потрудиться, чтобы реализовать этот план. В общем, мы провели огромную работу, которую теперь Копенгаген может скопировать. Мне, конечно, хотелось бы, чтобы порядок был обратным, они в Копенгагене проводили шоу первыми, а мы бы уже использовали их идеи", шутит она. "Для нас стало огромным преимуществом, что мы унаследовали конкурс не у Баку. Когда я обдумывал идеи организации Евродеревни, например, первым делом я спросил - как это все было организовано в Мальме. Для нас очень удобно иметь под рукой их опыт", говорит Ульрик Аммундсен. Он счастлив, ведь вероятно это позволило съэкономить сотни тысяч крон, которые иначе бы пришлось потратить на нанятых консультантов. В то время как проектная компания ESC 2014 планирует полагаться во многом на опыт Мальме, они пойдут и несколькими новыми, ранее неизведанными путями, отмечает Аммундсен. "Мы провели хороший диалог с представителями Мальме, посмотрели и приняли к сведению, что хорошо работает и может быть использовано у нас, но и предложили ряд своих инициатив. В итоге это будет хорошей смесью проверенного и нечто нового, неиспытанного ранее". Жители Копенгагена также смогут ожидать увидеть конкурсантов Евровидения, выступающих вживую в городе - точно такж как это было в Мальме. Но празднования на площади Gustav Adolfs Torg в Мальме в Копенгагене были расширены на целую "Фан милю" - расстояние от городской ратуши до Нюхавна. В качестве основной особенности Копенгагена Ульрик Аммундсен указывает на выбор самого места проведения конкурса: старую верфь B&W на острове Рефсхалеюн. "Выбором этой площадки мы двинулись в абсолютно новом направлении, разрабатывая историю соединения индустрии и культуры"..
"Если у вас что-то не получится, помните, что на расстоянии всего лишь 20 минут от вас есть готовая арена. Мы готовы стать запасным вариантом! ", шутит мэр Мальме Катрин Стьернфельдт Яммех. • Состоялась запись полуфинала литовского отбора. Take A Look At Me Now одержала победу в голосовании литовского жюри, а Attention стала второй. Некоторые видеозаписи доступны здесь. • 150 заявок принято на участие в румынском отборе. • Польская песня будет выбрана внутренним отбором после 20 февраля. • Стал известен порядок выступлений и прошла пресс-конференция презентация испанских песен. • Песни, принимающие участие в норвежском MGP будут презентованы завтра в 09.00 Москвы. Руководитель шоу Ян Лагерманд Лундме говорит, что они уважают концепцию Евровидения предыдущих лет. Но в то же время DR стремится обновить шоу и ввести его в будущее. Все тренды, которые применяются к другим развлекательных мероприятиям в наши дни, также будут влиять и на Евровидение. "Шесть или семь лет назад все развлекательные шоу были 'feel good TV' (ТВ хорошего настроения). Таким образом, в центре внимания всегда было то, насколько счастливы его участники. Это уже не обязательно сегодня. Сегодня мы можем также показать участников, которые нервничают, разочаровываются и грустят", говорит Лагерманд Лундме. "Мы все - люди, и поэтому, мы покажем людей во всем диапазоне их эмоций. Мы все знакомы с образами счастливых участников, сидящих и размахивающих флажками перед камерам. Такие кадры останутся, но мы также покажем виды нервозности и напряженности, которая характеризует участников". Это - выбор планировщиков шоу, но это также и дело техники. Датское Евровидение будет содержать больше крупных планов, чем когда-либо, оно будет приближаться непосредственно к участникам, чтобы уловить их чувства. Эмоции также будут показаны и в 40-секундных открытках между выступлениями. "На самом деле, это просто способ убить время, пока декорации одной страны убираются со сцены и она готовится для нового выступления. Однако, эти 40-секундные ролики в прошлые годы использовали всевозможными способами. В Азербайджане, например, из них сделали туристические рекламные ролики для страны-организатора, но мы хотели сделать нечто иное. Вместо этого, мы будем использовать это время, чтобы приблизить к зрителю участников и их страны. Это довольно сложно сделать за 40 секунд, но мы постараемся добиться этого, проводя артистов через процесс, связывающий их во внимании зрителей со странами, которые они представляют, и через то, как они пройдут этот процесс, зрители узнают их ближе", говорит Ян Лагерманд Лундме. Это еще один шаг над добавлением эмоций в шоу. "В прошлом году шведы добавили в шоу юмор. Это сильное чувство, и мы будем расширять этот результат, внося в него еще больше эмоций", говорит он. "После победы Эммели в Мальме, реальным трофеем, который получили мы, была USB-флешка, на которой содержался список всех задач и приоритетов для организаторов конкурса в будущем году", описывает он. "Это как эстафетная палочка, которую мы передаем. Или наш Олимпийский огонь".. Лундме даже признает, что фактически подготовка даже началась за несколько недель до победы в Швеции. "Не потому, что мы знали, что мы победим, но, увидев, что букмекеры считают нас явным фаворитом - мы ожидали победу. И потому мы задумались о том, как мы будем организовать конкурс в следующем году. Это не должно быть секретом, что мы действительно очень много работали в последние годы, чтобы одержать победу. Мы были сосредоточены на том, чтобы привезти конкурс обратно к нам, привлекая самых лучших авторов и исполнителей". Лундме считает, что вообще недавно побеждавшие страны объединяет именно то, что все они действительно хотели одержать победу. В настоящее время около 80 человек работают в команде организаторов шоу. К маю их количество достигнет около 400, некоторые из них отвечают за творческий процесс, некоторые - за технические детали. "Это событие того же масштаба, что и финал Кубка мира по футболу. Или вы можете взять любое обычное развлекательное шоу и умножить все в десять раз", говорит Лундме в интервью журналу Pengenyt. Вся организация проходит в тесном сотрудничестве с ЕВС, поскольку Евровидение - это их концепция, и шоу каждого года должны отражать их ценности. "Многие нас предупреждали, что с ЕВС довольно-таки сложно иметь дело. Однако, по мере того, как они видели наш прогресс, они все больше и больше расслаблялись. Поэтому, мы практически не получали отказов ни на одно из наших предложений", говорит Лундме. Он видит силу Евровидения в том, что оно является общеевропейским проектом. "Есть большие различия между странами в Европе, но песенный конкурс помогает объединить всех нас", говорит он. То, что касается всей Европы, также относится к Дании. "Это должно стать праздником всей Дании. Все датчане принимали участие в победе Эммели в том смысле, что они выбрали ее представлять нашу страну. Следовательно, все датчане должны почувствовать, что это их общий праздник", подчеркивает Лундме. Что произойдет в воскресенье утром, когда шоу закончится? "Когда я выпью свой кофе и немного отдохну, я, наверное, подумаю, что это была вечеринка всей Европы, которой мы могли бы гордиться". Но тяжелая работа не мешает ему мечтать о том, чтобы выиграть Евровидение снова. "Мы будем делать все возможное, чтобы повторить нашу победу, чтобы получить шанс сделать еще лучшее шоу в следующем году. Я вообще мог бы организовывать его всю свою оставшуюся жизнь", говорит он. DR и Eurovision.tv запустили две новые кампании для того, чтобы вовлечь поклонников конкурса в создание шоу Евровидения. Они продлятся с 17 февраля по 14 апреля 2014 года. Спойте для того, чтобы присоединиться к Эммели Де Форест в хоре Евровидения! Подпевайте записи и получите ваш шанс оказаться на большом экране. Миллионы зрителей со всей Европы смогут увидеть, как вы присоединяетесь к прошлогодней победительнице Евровидения, исполняя "Only Teardrops" в финале конкурса 2014 года. (Участие профессиональных певцов не допускается). Продюсеры шоу используют голоса поклонников конкурса для создание гигантского виртуального хора, который будет показан в рамках первого полуфинала конкурса Евровидение 6го мая. Или же станцуйте и запишите видео при помощи вашего мобильного телефона, чтобы вас пригласили на международный финала конкурса. Посетите страницу JoinUs.dk на вашем смарфоне. Покажите 15 секунд ваших самых крутых танцевальных движений - запишите их на вашем телефоне в горизонтальном видео для получения лучшего результата. Вы можете танцевать под любую музыку, или открыть страницу joinus.dk/track на втором телефоне или компьютере и станцевать под бит Евровидения. Самые лучшие и необычные танцоры будут приглашены за счет организаторов в Копенгаген - и смогут повторить свои танцы на сцене в рамках второго полуфинала шоу 8го мая. Все видео будут публиковаться на сайте JoinUs.dk. Руководитель шоу Ян Лагерманд Лундме говорит: "Одной из наших основных задач - и центральной темой конкурса Евровидение 2014 - является объединение людей. Для того, чтобы реализовать эту задачу, мы предлагаем всем жителям мира спеть или станцевать в шоу. Мы говорим вам: присоединитесь к нам! Это фантастика, что мы все можем объединиться для того, чтобы создать шоу Евровидения в этом году". 237 миллионов датских крон (31.7 млн евро) - такую цену Копенгаген должен заплатить за проведение конкурса Евровидение на Рефсхалеюне. Миллионы, однако, были выделены не только ради телевизионного развлечения - но и как инвестиция, которая может привлечь доходы Дании, Копенгагену и Столичному региону в будущем. говорит региональный президент столицы Софи Хесторп Андерсен (партия социал-демократов). Столичный регион уже выделил 10 миллионов на Евровидение, и недавно ему пришлось добавить 4.3 млн на непредусмотренные расходы. "Евровидение означает, что Копенгаген в долгосрочной перспективе будет иметь положительное брендирование, что поможет туристам открыть его для себя и чаще возвращаться сюда", говорит мэр Копенгагена по культуре и туризму Карл Кристиан Эббесен (Датская народная партия). Город выделил 14.5 млн крон на мероприятие. "Это инвестиции в будущее", также полагает и Йылдыз Акдоган (социал-демократы), член муниципального комитета по культуре и экономике, который должен утвердить выделение дополнительных 4.3 млн крон на Евровидение в конце месяца. Но, по мнению газеты Politiken, политики рисуют перед собой излишне позитивную картину долгосрочной прибыли от предстоящего Евровидения. Газета проконсультировалась по данному вопросу с рядом известных скандинавских экспертов. Среди них - профессор Томми Андерссон из деловой школы при университете Гетеборга, который изучает туризм и мероприятия. Он указывает, что без сомнения Копенгаген получит немедленную финансовую прибыль от туризма, например в продажах мест в отелях на неделе конкурса. Но в долгосрочной перспективе - то, что Евровидение принесет Копенгагену и Дании денежный доход - это миф. "Политики и туристические организации часто говорят о подобном эффекте, но нет никаких научных обоснований, что он приводит к увеличению потока туристов или рабочих мест", говорит он. "Исследования показывают, что даже Олимпийские игры не приносят долгосрочных позитивных эффектов, потому невозможно ожидать таких эффектов от финала Евровидения"
Одно можно сказать с уверенностью, считает Андерссон, это то, что Евровидение окажет позитивный эффект на жителей города, где оно проводится. Он сравнивает конкурс с организацией большой домашней вечеринки. Это стоит много денег - но когда ты встаешь утром и начинаешь убираться, то чувствуешь, что это было сделано не зря, потому что ты сам и твои гости получили хорошее удовольствие. "Самым большой эффект - это то, что местные жители станут свидетелями большого праздника в городе, получат от него удовольствие и ощутят гордость", говорит он. Газета отмечает, что туристическая организация Wonderful Copenhagen не проводила каких-либо исследований долгосрочных эффектов от проведения Евровидения, в частности не изучала влияние конкурса Евровидение 2011 на туризм и создание рабочих мест в долгосрочном плане. Вместо этого Wonderful Copenhagen упоминает только о немедленных эффектах до "80,000 ночей в отелях, туристические доходы до 125 млн крон и ценное всемирное освещение конкурса для 170 миллионов телезрителей." Но всемирное освещение не обязательно гарантирует долгосрочные экономические эффекты, говорит профессор Томми Андерссон. "Это правда, что конкурс привлекает всемирное внимание, но я не думаю, что это оказывает какое-либо значительное влияние на туризм или экономику. Нет никаких научных исследований, которые бы доказывали это. Потому, я отношусь к этому скептически". • Конкурсные песни непрошедших в полуфиналы участников бельгийского Eurosong: Jessy - "Beautiful"; Mr. Jones - "Still Believe"; Joyce - "I think I"; Whitebird - "Fire & Ice" доступны на iTunes. Объявлен состав участников полуфиналов. • Выпущены финальные версии песен, принимающих участие в испанском отборе. • Представлены 30-секундные отрывки песен датского Melodi Grand Prix. • Определены 3 песни, которые прозвучат в литовском полуфинале на этой неделе. 6 из 9 возможных комбинаций уже исполнялись, и их можно увидеть здесь. • Голландская песня группы The Common Linnets будет выбрана внутренним решением группы в конце текущей недели. • 23:00 Москвы, Азербайджан, "Böyük Səhnə". Avroviziya milli seçim turu, 2е шоу, iTV, онлайн. Эркин Османлы, Азад Шабанов, Диляра Кязимова, Самира Эфендиева, Хана Хасанова, Эльтон Ибрагимов вышли в следующий этап. • 23.24 Москвы, Венгрия: "A Dal", 2й полуфинал, M1, Duna World, онлайн. Kállay-Saunders и Fool Moon - выбор жюри, Dénes Pál и Honey Beast - выбор зрителей. Отдельные видео выступлений доступны здесь. • 23.30 Москвы, Бельгия: "Eurosong", раунд Call Back, Eén, онлайн. Bandits, Sil, Day One, 2Fabiola ft Loredana вышли в полуфиналы. Культовый датский мюзикл, основанный на песнях Евровидения - "Vi maler byen rød: The Musical" вернется на копенгагенскую сцену на неделе перед Евровидением 2014 в Дании. Шоу (автором которого стал Расмус Мансахс) впервые было исполнено в Копенгагене в апреле 2010 года и базируется на 24х крупнейших хитах датского Евровидения с 1950х годов по настоящее время. На премьере шоу присутствовала сама Бирте Кьяер, исполнительница песни с Евровидения 1989 года Vi maler byen rød (Мы красим город красным), которая дала свое название мюзиклу. Шоу получило статус культового еще задолго до ее премьеры, собрав наибольшее количество подписчиков на странице шоу в Facebook среди всех датских постановок. С того времени, оно ставилось несколько раз в различных городах Дании различными театральными коллективами, и стало одним из наиболее часто исполняемых мюзиклов последней декады в Дании. Мюзикл наполнен хитами Dansk Melodi Grand Prix: "Dansevise", "Hallo hallo", "Sku' du spørg' fra no'en", "Under stjernerne på himlen", "Krøller eller ej", "Disco tango", "Alt det som ingen ser", "Ka' du se hva' jeg sa'", "Kloden drejer", "Skibet skal sejle i nat", "Tænder på dig", "Danse i måneskin", "Video video", "Boom boom", "Vi danser rock og rul", "Denne gang", "Fra Mols til Skagen", "Hip hurra det' min fødselsdag", "Lige der hvor hjertet slår" и др. В выступлении примут участие 36 актеров, певцов и танцоров. Режиссером шоу стала Мария Луиза Корнелиус. Это юмористическое, праздничное и драматическое шоу о дикой датской молодежи 1980х годов, в котором рассказывается о школьном классе, в котором незадолго до выпускного возникает скандал. Любовь, семья, дружба, отношения, секреты, ложь и разоблачения проявляются на свет, в то время как мечты и желания молодых людей и их родителей подвергаются испытаниям, которых герои не могли и ожидать. По пути зрителей ждут тайны и сюрпризы, а также смех и слезы в рамках очень трогательного финала. 24го апреля 2014 года Vi maler byen rød: The Musical будет вновь поставлен в Копенгагене для того, чтобы отметить 25-летие песни, давшей ему название, а также в качестве разогрева перед конкурсом Евровидение в Копенгагене. Постановка будет осуществлена Musicalteatret на сцене Folketeatrets Store Turnéscene каждый день с 24 апреля по 3 мая. Билеты можно приобрести на Billetlugen.dk за 120-220 крон. • 23.00 Москвы, Литва: "Eurovizijos atranka", 10е шоу, LRT1, онлайн. Mia, Vaidas Baumila, Vilija Matačiūnaitė - финалисты литовского отбора. Запись шоу можно увидеть в архиве LRT здесь. Oscar Zia и Ace Wilder выходят в финал напрямую, Outtrigger и State of Drama примут участие в раунде Второй Шанс. Посмотреть запись шоу можно на SVT Play. • 23.24 Москвы, Венгрия: "A Dal", 1й полуфинал, M1, Duna World, онлайн. Király Viktor и Bogi - выбор жюри. New Level Empire и Depresszió - выбор телезрителей. Запись полного шоу можно увидеть здесь или отдельных выступлений здесь. • 23.45 Москвы, Исландия: "Söngvakeppnin", финал, RÚV, онлайн, Eurovision.tv.